Ollie Medwynter (left) misses Peterborough Sports' game at Carlton. 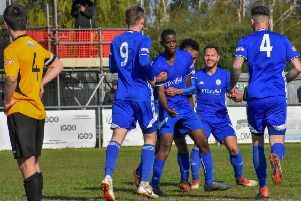 Peterborough Sports boss Jimmy Dean reckons his team need three wins from their final 10 matches to secure a second season in Division One South of the Evo Stik League. Sports are 16th in a 22-team league, but only one team is relegated this season. The city side’s biggest problem is the games in hand most of their rivals possess, but Dean is confident his side will steer clear of trouble. “They are two winnable games,” Dean stated. “And we could do with making sure we win at least one of them. “Three wins would probably be enough. There are a lot of teams who have to get past us and some of them will be facing a very hectic schedule. Top centre-half Richard Jones is suspended tomorrow, but will be back for the Loughborough game when Sports will chase a fifth successive home win. Key defender Ollie Medwynter is also absent tomorrow. Promotion-chasing Stamford AFC are at Leek Town tomorrow, while Spalding United, who are not safe from relegation, travel to fellow strugglers Kidsgrove Athletic. Spalding have a tough game at home to high-flying Frickley Athletic on Tuesday. Stamford are three points off an automatic promotion place, but they have played four more games than second-placed Alvechurch. Division One South: Carlton Town v Peterborough Sports, Kidsgrove Athletic v Spalding United, Leek Town v Stamford.